Strawberries and cream - quintessentially British and undoubtedly the perfect match. With Wimbledon around the corner we have reached that point in the summer months when everyone begins dusting off their tennis shoes, grabbing their rackets and making for the nearest court, garden, street, park or any other available space to hone their skills. I have, once again, taken advantage of my shortbread recipe, after all shortbread is always delicious with strawberries! I was lucky enough to stumble across this when I was browsing the shelves of my local health food shop. It is 100% cold pressed coconut milk making it perfect for a light fresh cream. 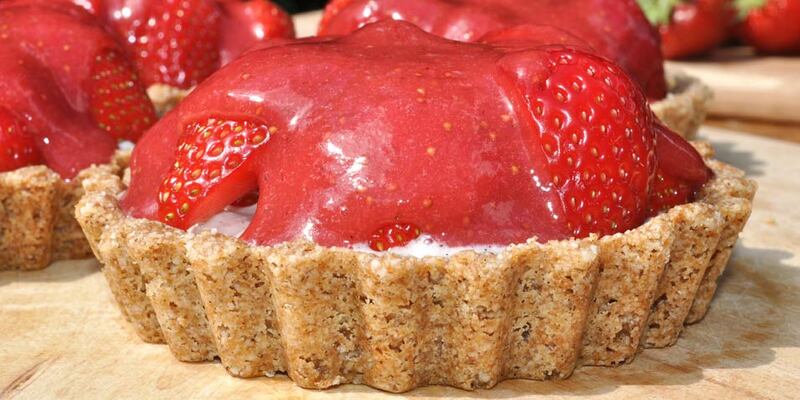 It needs to be eaten on the day it’s opened so be sure to be ready to consume your Strawberry and Coconut Cream Tarts the day you make them (the shortbread base and strawberry sauce can be made in advance.) Honestly this product has the most amazing taste and is absolutely perfect as an alternative to whipped cream. If you can’t get your hands on any, place a can of coconut milk in the fridge overnight. This will separate the water from the coconut milk. Open the can upside down and pour the water out. (Be sure to save the water to add to a smoothie!) What you are left with is rich creamy coconut milk that can be whipped in the same way. 1) Lightly coat four, 4 inch tart tins with coconut oil. 2) Cream together coconut sugar and coconut oil. (I use my bamix for this but a whisk would be fine.) Gradually fold in the almond flour, arrowroot powder, powdered vanilla and Himalayan salt. 3) Press the mix into the base of the tart tins coming up the side and place in the fridge for 30 mins. 6) Whip together the coconut milk, arrowroot powder, powdered vanilla and agave nectar. 7) Once the bases have cooled and you're ready to serve remove from the tin and fill each base with whipped coconut cream. Layer strawberries over this and finally pour the strawberry sauce over the top. 1) Hull and slice 1 Cup of strawberries and place in the dehydrator on the fruit setting for 2 hrs. 2) Use a handheld blender such as a bamix to blend the dehydrated strawberries, the remaining ½ Cup of strawberries and agave nectar together until they are completely smooth.